MITZPE RAMON, ISRAEL–This region has a very deep human history, and some of it is evident in subtle changes to the landscape itself. 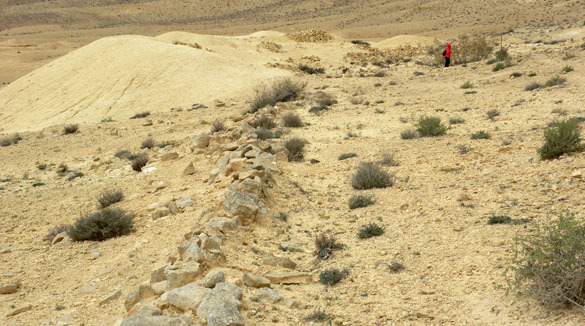 Throughout the northern Negev are simple stone structures that are sometimes called “Davidic forts” after King David of Israel. They are, though, a lot more mysterious and difficult to date. They are usually associated with cisterns and water systems, and so they may have indeed been guardposts of some kind. Who exactly made these buildings and the water infrastructure is unclear. All we can say is that they are Iron Age and show an early agricultural people who had skills in collecting and managing the scarce water resources of this area. We saw evidence of them today in the field north of Mitzpe Ramon. 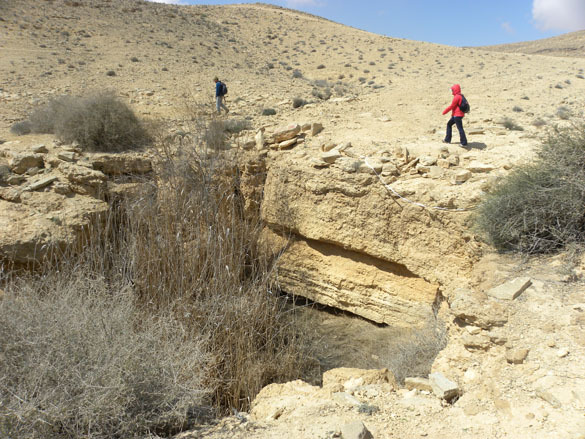 Above you see Yoav and Melissa walking by one of these open cisterns cut into Upper Cretaceous limestone (the Vroman Bank of the Ora Formation) and then dug below in shale and claystone. The hillsides to the sides and above these cisterns have long ditches lined with slabs of limestone on their downward sides. These were designed to catch runoff water from the slopes above and direct it to the open cistern below. Some of these ditch-and-rock channels stretch for kilometers. Here a ditch heads to a large cistern, recognizable immediately by the sediment tailings dug out of the hole. This system takes advantage of the heavy and infrequent rains in the northern Negev. Sheetflow and water in small natural channels is captured and sent along the gentle gradient to the cistern below. By keeping the water from flowing too fast these early engineers minimized erosion of their channels. This is the second cistern we saw today. It is many meters deep and could have held a great deal of water year-round. Bedouin herders today still use some of these cisterns for their flocks. The later Nabateans elaborated upon these innovations and made roofed cisterns to reduce evaporation (which is 2.5 meters of water per year in Mitzpe Ramon). Sometimes they dug their cisterns into solid limestone rather than shale so they could have a small top opening and large covered container below. As I write this the wind howls and rare rain is falling on the Negev. These rock systems are still channeling water after 3000 years! MITZPE RAMON, ISRAEL–These were a delightful surprise this morning. 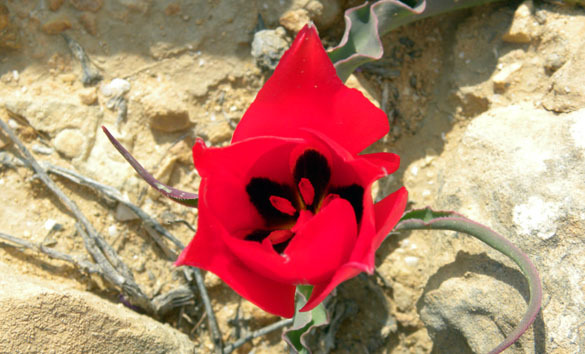 Scattered across the rough Cretaceous limestones were these astoundingly red desert tulips (Tulipa systola). They looked like drops of blood across the landscape. (An unfortunate metaphor in this part of the world, but true nonetheless!) They are so red they even overwhelm the red distinctions in my digital images, making them just glow like light bulbs. These tulips are very sensitive to soil moisture. Because of the drought, Yoav was impressed we saw any, let alone dozens. All appear to be nestled between rocks which might have preserved just a tad of moisture for their growth. 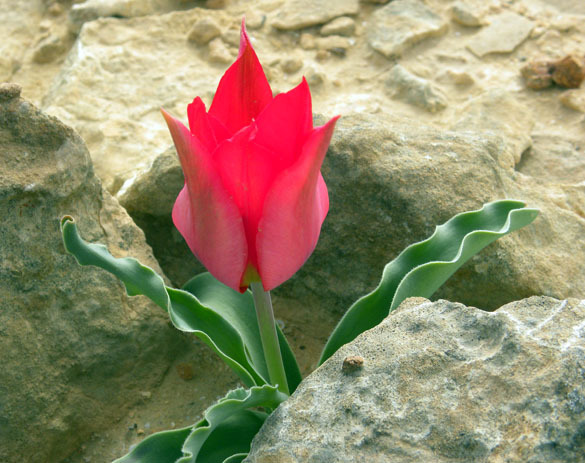 Many other tulip plants can be seen in the area, but only a minority are flowering. Hard to believe with these warm, bright colors that we were freezing in the wind as we admired them! 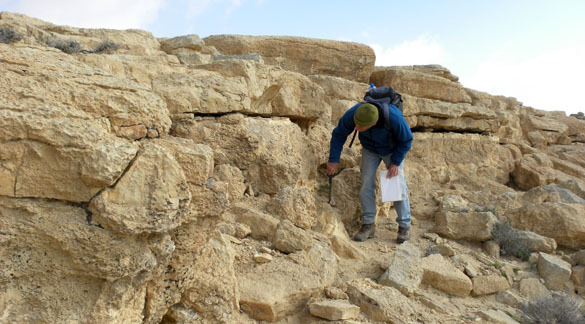 MITZPE RAMON, ISRAEL–Melissa and I finished our work in the Jurassic of Makhtesh Gadol yesterday, so today we went out with Yoav to explore the Upper Cretaceous and Eocene exposures just a few kilometers north of Mitzpe Ramon. This is what we do near the end of each expedition so that we have more ideas for the next. It was cold and very windy on the barren hillsides this morning, but we still saw and learned a great deal. We examined outcrops of four units: The Ora Formation (Upper Cretaceous) is primarily shales and claystones and below the stratigraphic column shown above. 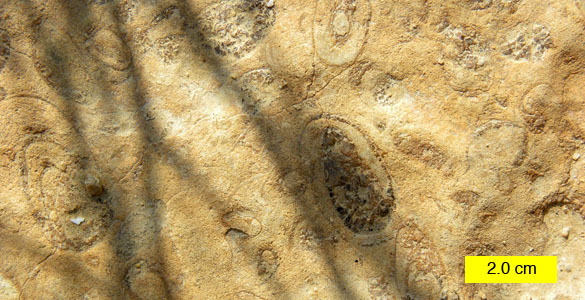 It has an interesting limestone unit composed mostly of rudistid bivalves and their shelly debris shown later below. 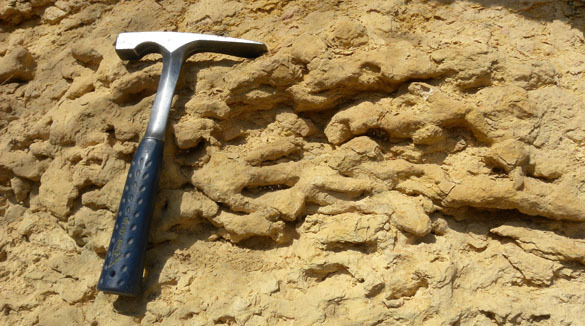 The Gerofit Formation, also Upper Cretaceous, is a mix of limestones and marls unconformably above the Ora Formation. 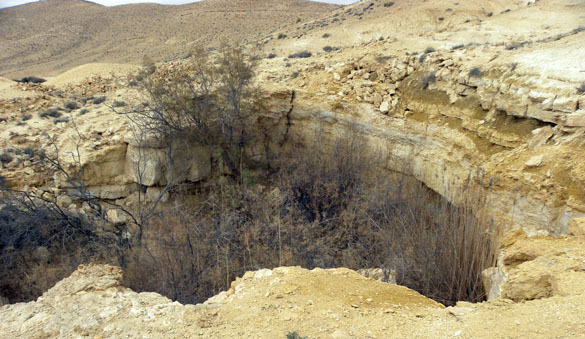 The Mishash Formation (Upper Cretaceous again) is a chert-rich unit unconformably above the Gerofit here. Andrew Retzler and Micah Risacher, who worked in the region two years ago, will immediately ask, where are the Zichor and Menuhah Formations that are supposed to be between the Gerofit and Mishash? They are absent due to a deep unconformity. On top of the Mishash, above another significant unconformity, are nummulitic limestones of the Avedat Group (Eocene). These three unconformities are all structurally and paleoenvironmentally significant — and they no doubt will be future projects for Wooster Geologists. Some items of interest in this long section. Just below the Vroman Bank in the Ora Formation is the above cemented horizon with well-distinguished Thalassinoides burrows. These were produced by crustaceans burrowing into stiff mud in shallow waters. This unit is usually not very well exposed, but Yoav and I dropped down into an ancient cistern to see this outcrop. This is a polished surface at the top of the Vroman Bank in the Ora Formation. Erosion in a small wadi over the centuries smoothed it off. We can see here borings known as Gastrochaenolites, some with outlines of bivalve shells still inside them. 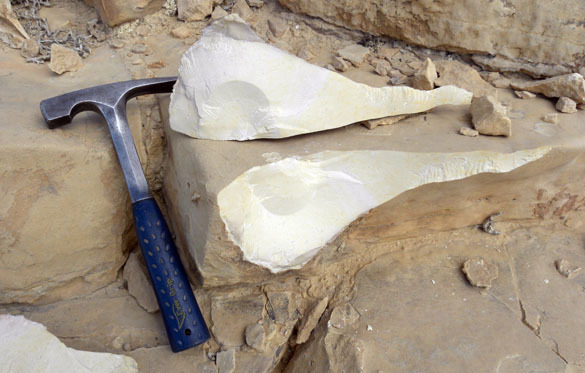 This is thus a carbonate hardground. Some of the units in the Gerofit Formation are lithographic limestones, meaning they are very fine-grained and of uniform composition. You can see in the above photo that the stress pattern around my hammer blow is preserved as a nearly perfect sphere. This rock has been the premier building stone in Israel for millenia. It is known as “Jerusalem Stone” because so many buildings in that city are made of it and its equivalents. Melissa is standing in what appears to be an ancient quarry for the lithographic limestone. There is a small Iron Age fort made of the stone nearby. Note how bundled up Melissa is. Not the usual image of Israel in this blog! Finally, all our localities today were on ground that has been part of an IDF training base for decades. There is much discarded military gear around. I thought I would add this old British tin-hat to our blog’s collection of shot-up helmets! (We have German examples already, and somewhere in there is a Russian set.) I neglected to take a photo of a well-worn Egyptian helmet we found this morning.